Advantages: Versatile usage; different effects depending on your requirements. 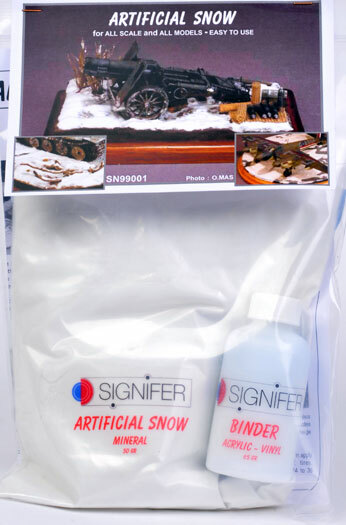 It doesn't matter what scale you like to work with for this product, snow, well artificial snow. This is a two part product consisting of the powder marked as Mineral and a bottle of binder marked as Acrylic Vinyl. It is very easy to use. You simply measure out the amounts required as per instructions, mix them together and then add water. Different effects may be obtained depends on the type of finish you want by using different amounts of the ingredients. Just apply the snow mixture to your project, and allow to dry. You now have a very effective snow scene. I think that this is an excellent product, simple to use and very effective.